This cumin barbecue chicken kebab is perfect for Memorial Day weekend BBQ. A peanut lime dipping sauce adds a sweet and nutty flavor to the marinated chicken. It’s Memorial Day weekend and that means it’s time to barbecue! As in Cumin Barbecue Chicken Kebabs with Peanut Lime Dipping Sauce. I hope everyone is enjoying this special time, spending it with friends and loved ones, eating good food with a cold drink in hand. In that past I’ve used the long weekend to go camping in the lush forest of the Sierra Mountains, spend the day at the beach, or just stay local to avoid traffic and barbecue with friends. This year I’m going with the latter, and enjoying a nice relaxing weekend. Of course I’m taking advantage of the time and working on recipes and ideas for the blog. I decided a recipe for barbecue is a necessity. 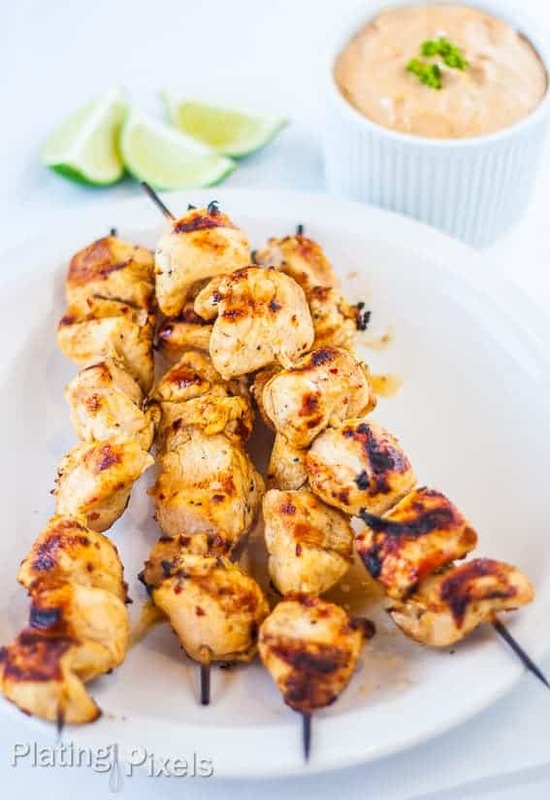 This Barbecue Cumin Chicken Kebabs with Peanut Lime Dipping Sauce recipe is great for parties as it’s easy to make and can be adapted to feed a large group of people. Make as much as you need and serve a large platter of this grilled tangy spiced chicken. 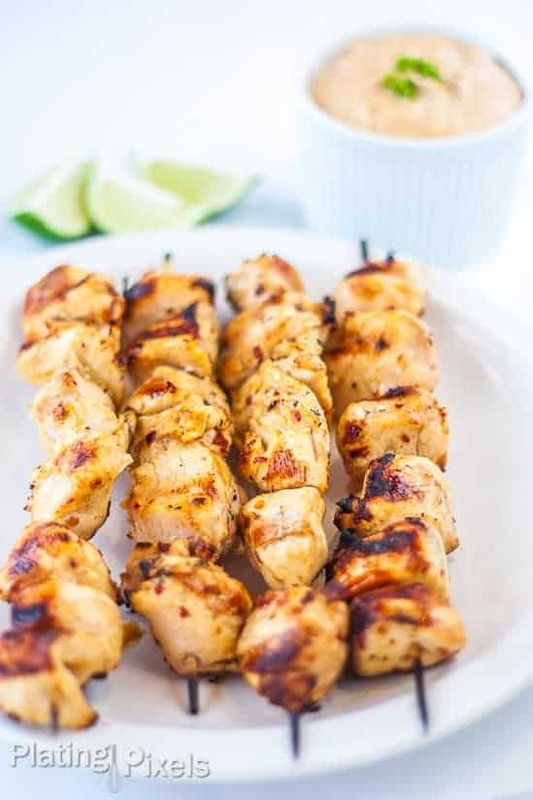 The peanut lime dipping sauce adds a unique sweet and nutty flavor to the already marinated chicken. There’s something about grilled meat on a stick (or veggies if you’re vegetarian) that’s so fun to eat. It’s acceptable finger-food that brings me back to childhood wonder. Marinades with acidic properties like vinegar and/or citrus add flavor, while helping to tenderized meat by breaking down proteins. If using wooden skewers, soak for at least 3o minutes in water to prevent burning on grill. I shot this in natural light at 1/160 sec, f/ 1.8, . Memorial Day is synonymous with white clothing, and barbecuing has become a national way to celebrate this holiday. I wanted this image light, airy and mostly white, emphasizing the distinctive grill marks and color variations of the chicken skewers. All white dishes on a white background give this image that unique feel. The lime wedges and dipping sauce (with lime zest on top for contrast) in the background show all the elements of this recipe. 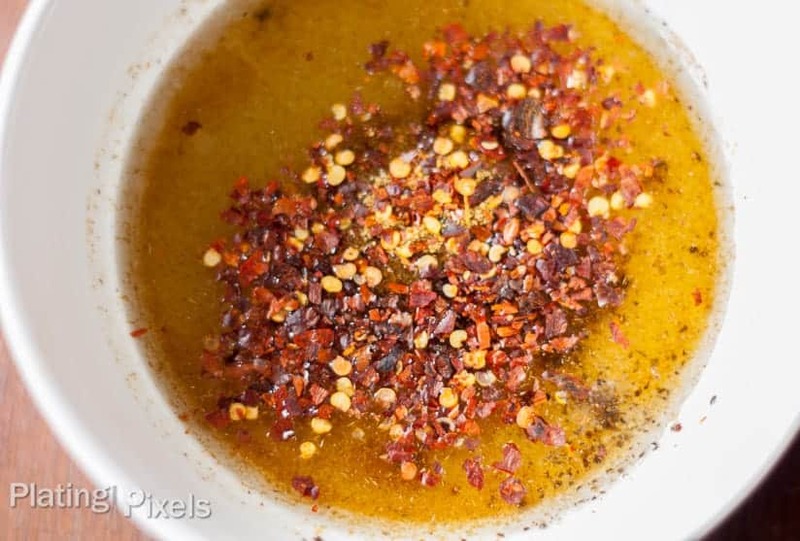 The other image of the marinate is visually appealing with red pepper flakes and spices floating on an oily surface, and shows that step of making the recipe. Cumin barbecue chicken kebab perfect for Memorial Day, with a peanut lime dipping sauce . To create marinade for chicken, in medium bowl mix 4 tablespoons lime juice, olive oil, cumin, red pepper, salt and pepper. In large ziplock add marinade mix and chicken breast pieces. Seal and shake to evenly coat chicken. Marinate for 30 minutes. Do not marinate longer as the acid from the limes will start cooking the chicken. Meanwhile, in medium bowl combine 2 tablespoons lime juice, lime zest, peanut butter, milk and sesame oil. Mix together to create dipping sauce. Heat gas or charcoal barbecue to medium heat. Place marinated chicken pieces on skewers, discard marinade. Pieces should be just touching each other and not packed together tightly. This allows for even cooking. Coat paper towel with olive oil and use to lightly coat heated grill (this prevents the chicken from sticking). Place skewers on grill and cook chicken 10-15 minutes, rotating every few minutes, or until brown on outside and cooked white on the inside. Serve chicken skewers with dipping sauce on side. Add more or less milk to create desired thickness of sauce. Should be thick enough to stick to chicken while dipping. Making this on the weekend- I LOVE anything cumin spiked! I now know what I’m making for dinner! This looks incredibly delicious. Thanks Stephanie and hope you like them! Oh man these look delicious! We love grilling out in the summer, especially kebabs! Thanks Emily! Grilling is one of my favorite parts of summer too, including kabobs! Now that’s it’s summer we’ve been grilling a lot with friends too! Thanks Becky! What a wonderful summer recipe. I have been want to try kabobs this summer and we haven’t yet. This looks like a perfect place to start! Looks amazing! We’ve become addicted to kebabs lately, and I’ve been looking for new recipes. This would be great to try! Hi Matt- I love the lime – peanut butter combination in the dipping sauce. The sauce takes grilled chicken to a whole new level of flavor. And I really enjoyed hearing your thoughts behind the photos you took. What a great, unique feature to your blog. I’m looking forward to checking out more of your photo analyses. Thanks Dana! Glad you like the sauce and my blog. Most of my recipes have this but I’ve been focusing more on cooking tips and food science. Hope you keep coming back! Good point Katie. You could totally use almond milk to thin it down. I bet the sauce would be good with grilled mushrooms. Thanks! Really liking the idea of lime with the peanut sauce, makes it extra “Summer” feeling! That lime peanut dipping sauce will be a hit in our house. Sounds great! These look wonderful! I love that you added cumin. Makes chicken have that mediterranean flavor. Delicious! Can’t wait to try this one on the barbecue. This looks like a great recipe. I will share it with my husband. Hopefully we can try it soon! Thanks Melanie! I hope you do too and that he likes it!